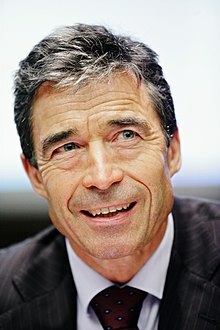 Anders Fogh Rasmussen (born 26 January 1953) is a Danish politician of the centre-right Liberal party, Venstre, and the 12th and current Secretary General of NATO. Rasmussen served as Prime Minister of Denmark from November 27, 2001 to April 5, 2009. Iraq has WMDs. It is not something we think, it is something we know. Iraq has itself admitted that it has had mustard gas, nerve gas, anthrax, but Saddam won't disclose. He won't tell us where and how these weapons have been destroyed. We know this from the UN inspectors, so there is no doubt in my mind. That's what it's like when people have crawled very high up in a tree, then they sometimes need help to get down with ladders and ropes and other instruments. The good thing is that all the symbolic elements are gone, and that which really matters – the core – is left. I was deeply distressed that the cartoons were seen by many Muslims as an attempt by Denmark to mark and insult or behave disrespectfully towards Islam or Mohammed. It could never happen in Denmark, Danish people are much more calm than those further south. I often use Sweden as a discouraging example to promte a free and open debate and maintain a strict immigration policy. A. Fogh Rasmussen, in Sveriges Television 2016 program Toppmötet interviwed by Fredrik Reinfeldt, second episode. Youtube clip (in Danish). This page was last edited on 16 March 2017, at 06:47.